Nicki Minaj isn't letting her fight with Cardi B define her New York Fashion Week experience. The "Anaconda" artist attended the Oscar de la Renta show on Tuesday and brought along one very special guest—her mom, Carol Maraj. The mother-daughter duo turned heads in their dresses from the late designer's eponymous brand. The matriarch wore an amber stretch wool dress with crystal embroidery while the rapper donned an embroidered leather and tulle cocktail dress. The family members held hands as they posed for pictures at the show, which was held at Spring Studios Terrace in Manhattan. Sitting front row, they took in the fashionable clothes with their fellow celebrity guests, including Sofia Richie, Nicky Hilton Rothschild and Rosie Huntington-Whiteley. 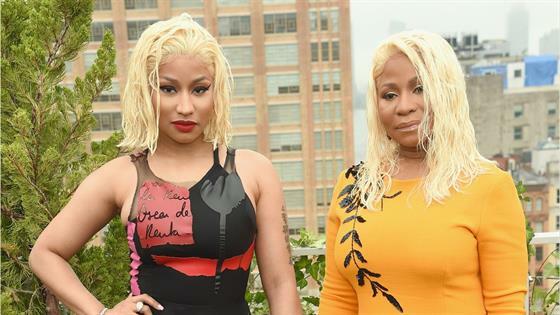 Minaj and her mother seemed to enjoy their time together. "Mommy & Me in #OscarDeLaRenta," Minaj wrote on Instagram alongside a photo of the pair. "GORGEOUS SHOW." After all the drama that went down at the Harper's Bazaar Icons party, it's no surprise Minaj needed a little mommy-and-me time. According to footage from the event, Cardi B lunged at Minaj and started shouting. She even threw a red heel at her fellow rapper and accidentally revealed her own underwear during the tussle. "It was so fast!" an eyewitness told E! News. "I heart someone screaming—everyone recognized Cardi's voice—people either got out of the way or took out their phones and started filming. Nicki was surrounded by a bunch of guards and barely even looked at her. Next thing you know, shoes were flying and Cardi was on her way out." However, Minaj would likely prefer to forget the whole incident. "The other night, I was a part of something so mortifying and so humiliating to go through," she said during a recent episode of her Queen Radio show. Referencing the "upper echelon" crowd that saw the fight firsthand, she then added, "The way they passed by looking at this disgusting commotion, I will never forget. I was mortified." Police arrived at the Plaza Hotel, where the party was held, around 11:00 p.m. While the officials claimed there were no visible injuries, the new mom left the party with a sizable mark above her left eye. After the altercation, Cardi B took to Instagram to seemingly tell her side of the story. "I've let a lot of s--t slide! I let you sneak diss me, I let you lie on me, I let you attempt to stop my bags, f--k up the way I eat!" she wrote. "You've threatened other artists in the industry, told them if they work with me you'll stop f--kin with them!! I let you talk big s--t about me!!" However, it seemed to be an alleged comment about her daughter, Kulture, that really upset the "Bodak Yellow" star. "I addressed you once in person, I addressed you a second time in person, and every time you copped a plea!!" she continued. "But when you mention my child, you choose to like comments about me as a mother, make comments about my abilities to take care of my daughter is when all bets are f--kin off!! I've worked too hard and come too far to let anybody f--k with my success!!!!" During her radio program, Minaj denied saying anything about Cardi B's child. "I would never talk about anyone's child or parenting," Minaj said. "I don't care about anyone's parenting. I don't give a s--t and it's so crazy to me that people always need to make Onika the bad guy. I just want to let the world know that Onika Tanya Maraj would never, has never and will never speak ill of anyone's child." Several stars have since reacted to the fight. Tiffany Haddish, for instance, said she had "nothing" to do with it and even jokingly referenced the Beyoncé biting scandal. "I hope that nobody get bit though," she said.